Values | Love, Prayers, and a Party! Love, Prayers, and a Party! “This will be awkward.” That was the direction my thoughts were going as we pulled up to the front of the Sri Ram Ashram. It was a similar feeling to meeting unknown relatives at a family party because this was a meeting of family, an extended family from across the ocean connected by a couple threads that are trying to sew the two pieces together. We were finally about to meet face to face, and I had no idea what to do. As I exited the bus I flashed back to my first song share escapade, the feeling of being in front of people I barely knew, and being expected to bare my heart and soul to them. On the first day at the ashram, even though the ashram kids were extremely hospitable, I felt out of place; my introverted shell was covering me, in a struggle for survival. However, this morning I remembered something that struck me years ago. It was the following quote, “Life begins outside your comfort zone.” With this in mind I just stepped out of my comfort zone and made new friends. Today was filled with tales detailing the falling of people like mangos on a windy day, and failing to keep on the level of the kids in badminton. This place has a special aura of kindness and acceptance. I have not been able to resist smiling and laughing since my epiphany this morning. Now I can’t wait to hangout with my new friends. 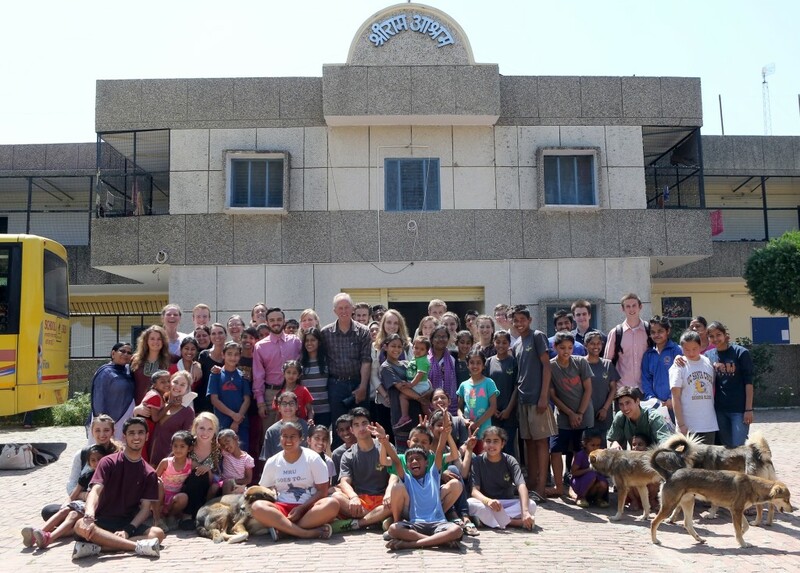 After an early, but easy, train ride we have arrived at Haridwar and then traveled on to Sri Ram Ashram. For some reason when we first arrived we were all a little shy. Happily that didn’t last long, and soon we were all together cleaning up the dust, and what not, that was left over from the amazing stage they had just built outside. After we were done with the work, which was fairly easy, we got to get into our shorts and other informal clothes and go out to play with the kids. 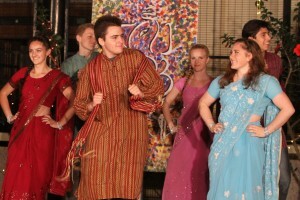 I have to say that the Ashram boys are amazing. They seem to be game for anything, and of course the fact that their English is so good makes it easier. The day after we arrived we got up at around 6:30 AM, had breakfast, and headed over to the school next to the Ashram to attend an assembly. During the morning assembly a scholarship, in honor of a student that had passed away during his 12th year, was awarded. 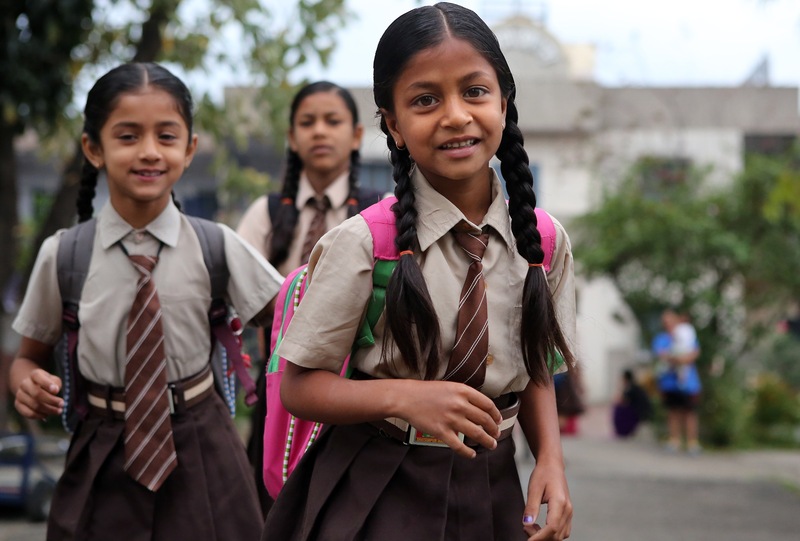 The school was very well built and maintained, which was refreshing after seeing so many run down buildings. After we left the school we spent some more time hanging out with some of the older kids. In the afternoon we went to tea at the house of Mrs. Mishra, a trustee of the ashram. Her house is beautiful and over 100 years old. It is built along the Ganges and we got to stick our feet in the river. After tea we plunged head first into the crowded bazaar slowly working our way towards the river and aarti. Hari ki pauri was crowded but beautiful, and absolutely indescribable. All in all Haridwar has been amazing, and I wish we could stay for another couple of days. Ward leaned over to me and said, “Can you feel it? Can you feel the current?” It was something I have felt very few times in my life, and never of this magnitude. It was a current of pure devotional energy, pouring from ten thousand open hearts that surrounded mine. 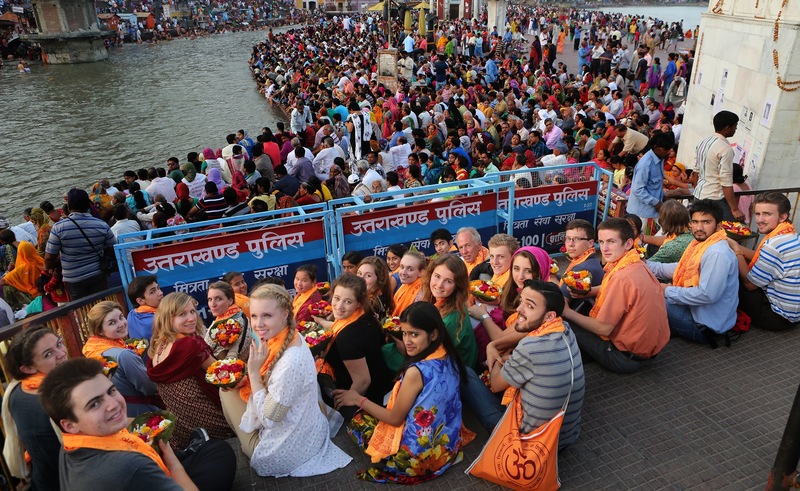 When the aarti ritual of prayers, lighting torches, and dumping offerings into the Ganga was finished, we got up from the steps we were sitting on and squeezed our way through the crowd to the river. One by one we took off our shoes, lit the candles that sat in the middle of our flower boats, and let them float down the river. Although the act of letting a flower boat go into the river is very simple, the profound meaning that is embodied in it is what makes it such a significant action. 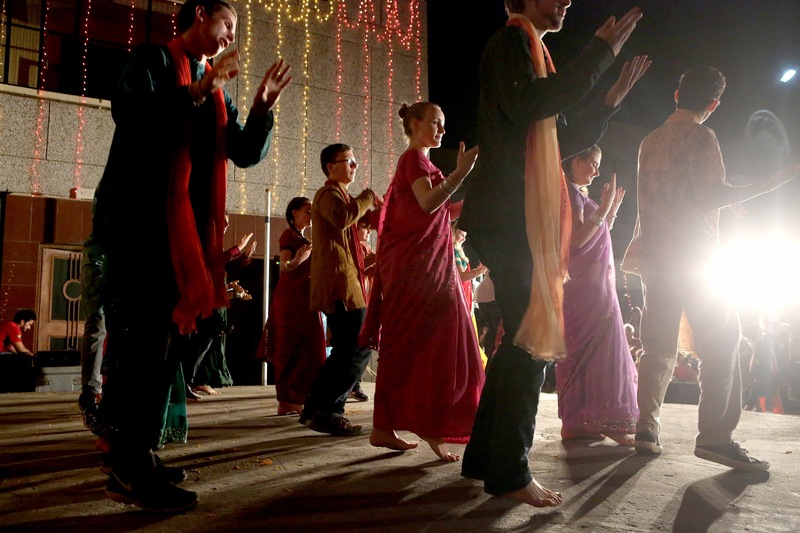 Aarti is one of the traditions that speaks to the “magical realism” that is so often associated with India. While I was conscious of my body and mind, there was a certain aspect of magic that seemed to settle over the scene that was laid out before me. It is these rare moments when a magical dimension is added that allow me to be filled with a sense of complete joy and appreciation, instead of worrying about the future or regretting the past, like I am so prone to do. 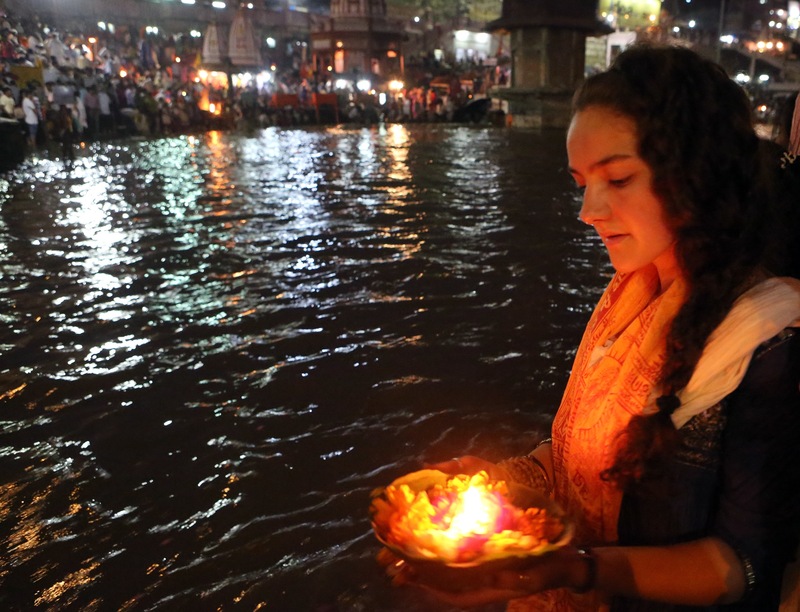 Participating in aarti, on the Ganga in Haridwar, is one of the most auspicious spiritual experiences for a Hindu. It is a time when the status of wealth seems to suspend and everyone simply exists side by side, in pure devotion to the religion that is so much a part of their lives. 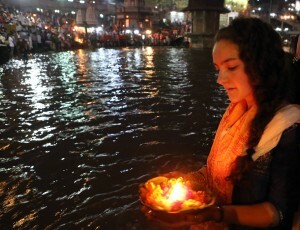 I may not be religious but to be able to see the enormous flames being waved across the river, hear the prayers blare over the speakers above me, and feel the religious fervor saturated into the crowd as we let our flower boats go with the flow of the river, was an inimitable experience. After spending the morning playing with the kids at Sri Ram Ashram we went to visit a Gujar Village. I didn’t know much about the village, other than the fact that it was deep in the jungle. Expecting little, but hoping for a lot, I boarded the school bus and we set off. We crept through the peaceful gates of the Ashram and entered the usual mayhem of the Indian streets. Soon I spied a small, slightly paved, path to my left. I expected to pass it but we didn’t. We turned right and went down the path. Soon it turned from a cramped, poorly paved path, into an even more cramped, non-paved path. I was impressed and surprised. We crossed a bridge and headed into the jungle, toward the mountains. The path became even smaller, hilly, and full of river rocks. The school bus kept going. This road started to remind me more of a bike path, and I became even more impressed than ever with our driver. As we went deeper, intricate mud huts with thatched roofs started popping up around us. Dozens of curious faces peeked out from inside. We finally came to a stop at what appeared to be the end of the beautiful jungle houses. 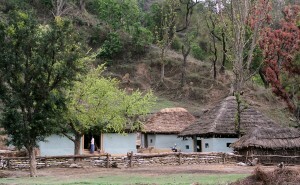 At the foot of the mountains there were about ten blue mud buildings, surrounded by jungle and buffalo. These buildings, along with similar ones we had passed before, make up a string of Gujar villages. 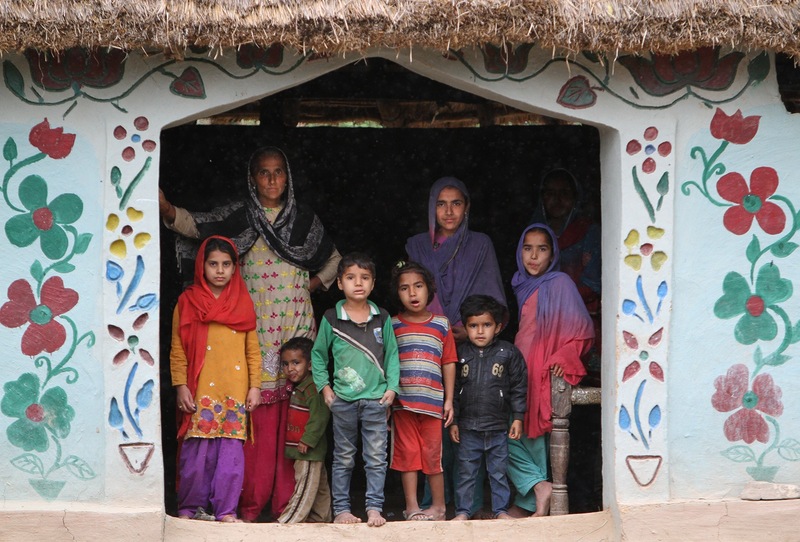 The Gujars have chosen a life of simplicity and serenity. They are living a life that is very foreign to me. The ten huts before us housed one extended family. We were lead through the huts. The people inside seemed willing and eager to show us their homes and share a bit of their lives with us. 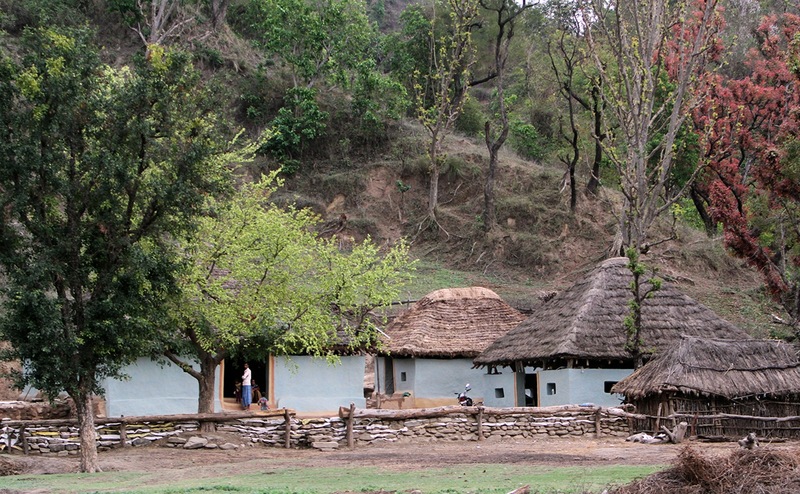 The Gujars were only able to share a little of their history with us but that did not deter from their culture. 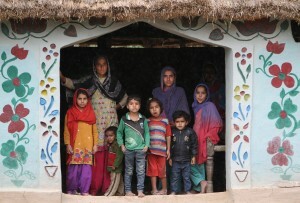 The experience of visiting their village exceeded my expectations and fulfilled my hopes. We toured around the last of the huts, while the clouds opened up, and the rain came pouring down. With that we bid farewell to our gracious hosts, the buffalo too, and climbed back in the bus, ready to go. The rain made the ride back even more exciting and thrilling than the one there. We had to get out of the bus a few times and we walked down the road, slipping and sliding the whole way. Eventually the bus made it back to the pavement and he adventure came to a safe end, all thanks to our talented and determined bus driver. In my opinion, Sri Ram Ashram has been by far the most memorable part of our journey thus far. The people, the community, the beautiful facilities, the fact that I could drink water without the paranoia of disease, and the general atmosphere of the ashram, are all astounding. In its entirety, it was a much-desired break from the hectic hubbub that is so common throughout India. A common theme in our Values class with Ward and Shannon is to hold on to every moment, and to stay in the present as much as possible. They wanted us to do this so that senior year, and all its varied and important transitions and experiences, wouldn’t fly out the window with the looming due date of our departure to the next step of our education, college. I wish I had kept this in mind when I arrived the first day. “OH MY GOD I AM SO TIRED,” was about the only thought running through my jetlagged and overwhelmed haze of consciousness. After a full day of cruising around in a foreign country, in a system you’re unaccustomed to, it’s hard to think any differently. At the end of our ever-tiresome travels to the next link of our journey, our school bus squeaked through the ashram’s gates late in the afternoon. We were introduced to the kids and the area in which we would be living for the next three nights, served dinner, and were sent to bed at 9:00 PM. I had no idea what I was in for. I spent the next day in a similar fog-ridden state of consciousness, though the day’s events helped to snap me out of it. Shopping in a bazaar located in alleys as wide as school hallways, and packed to the breaking point with local merchants, buyers, and beggars, and seeing tens of thousands of people giving their offerings of fire and flower at aarti kept me on my toes. 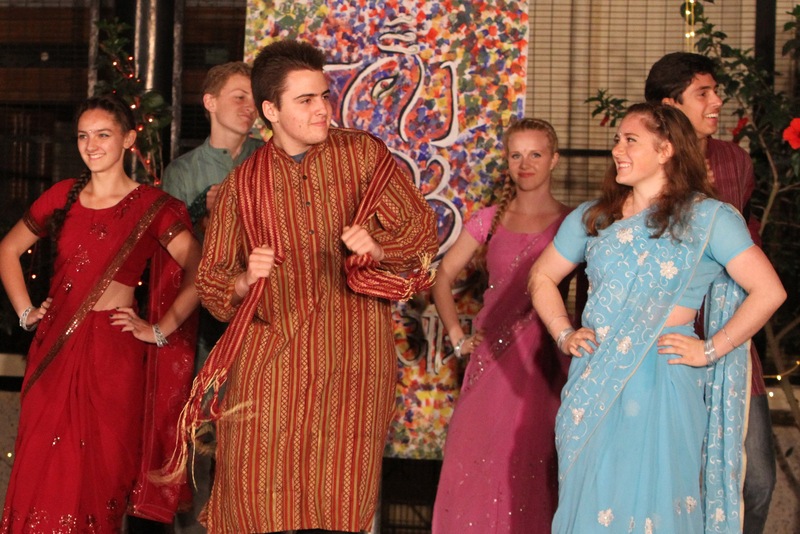 I certainly wanted to avoid being lost in the overwhelming nature of India’s culture. It wasn’t until the day before we were bound to depart that I really bonded with the individuals of the Ashram. It was the third day of our stay at the Ashram, and we had just gotten back from a short trip to the Gujar Village. Everyone filed out of the bus in an orderly fashion, but broke free once their feet touched the ground so that they could race off to prepare for the evening’s events. A party had been planned for the last night at the ashram. They had spent weeks planning the festivities. All of the ashram locals had rehearsed dances; and during our stay they had taught us a dance that we would be performing as well. When the time came, we all did our performances, and they were all absolutely fantastic. I enjoyed every single one. Once everyone had finished, Ward gave a summation, showing gratitude and appreciation for the man who inspired the ashram and Mount Madonna and made this all possible, Baba Hari Dass. After he was done we set off for the wonderful dinner that had been prepared. Although I was a little tired of Indian food, because of how much of it we had eaten in the last few days, I ate three servings! After dinner I jumped onto the stage, which was now the abode of a full-blown dance party, and started the flailing that I like to call dancing. In the midst of it all, I felt a tug at my shirt. I turned, expecting to meet someone at eye level, but instead I found a small girl, no older than five, staring at me. “Up,” she said. At first I was confused and didn’t hear her because of the ruckus that was surrounding me, so I bent down and lent her my ear so that I could understand. Again she said “Up.” Then I understood. She wanted me to give her a piggyback ride. When I think back to every picture I have seen of Mount Madonna School students with children on their shoulders, there are undoubtedly in a very peaceful settings, like a meadow or the inside of a home. Never, in all of my days, would I have expected someone to ask me to put her on my shoulders in the middle of a dance party. I didn’t give it a second thought at the time, however. It was only after the party that I realized how strange of an occurrence it was. I kneeled down and let her jump up onto my shoulders. She stayed there for about 20 minutes, while I was mingling with the other kids and dancing like a madman, to songs I had never heard before, in a language I had no understanding of. I even asked her if she wanted to go down several times, and every time she responded in the same tiny voice, “No.” It was a profoundly touching experience for me to see how open and trusting everyone at the ashram is, including this little girl. The next day, while I was hanging out with two guys named Raj Pal and Narayan, I felt another tug at my shirt. There she was again, except this time she was asking me to give she and her friend a push on the swings. Once again, I dedicated about half an hour of my time to pushing the both of them on the swing sets. During this time I learned that her name is Preeti, and her friend’s name was Simi. 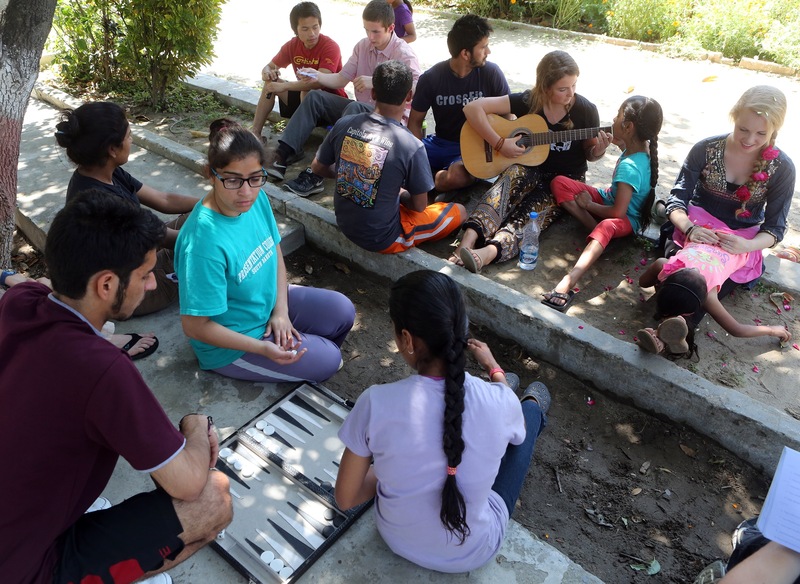 Prior to our time at Sri Ram Ashram, the majority of us had been too exhausted to form a coherent sentence, let alone interact with someone through a language barrier. Now we were all happily conversing, as if we had known each other for more than one lifetime. I knew that I would miss this place because of the many memories that I had formed. Fortunately, I will keep the lessons, and dances, that they have taught me close to my heart, and I am sure that a day will come when I use them. I would have never thought that my feet could withstand two jam-packed hours of eccentric and exciting dance moves. 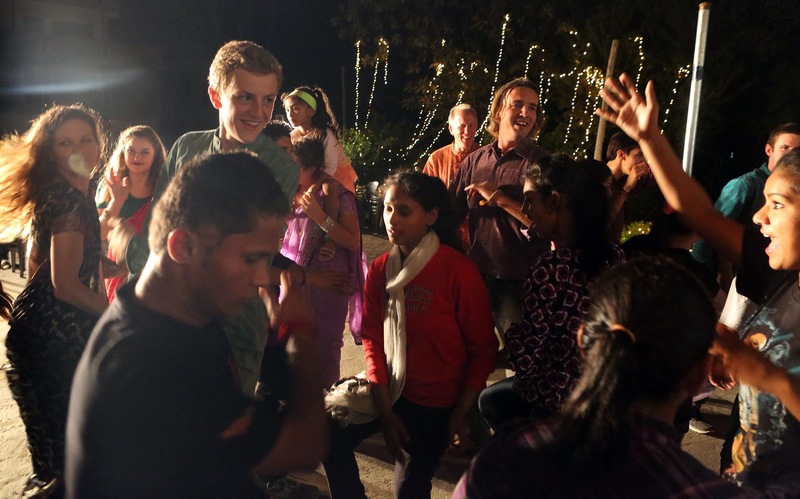 The going away dance party thrown by our Sri Ram Ashram family will go down in my memory as some of the most wholesome fun I’ve ever had. The kids took turns throwing out sporadic dance moves that fit perfectly to the bouncing beat of whatever song was playing. During our dance party there was nary a dull moment on the brightly lit, cement stage. I moved from group to group, and danced along to each of their unique dance styles. 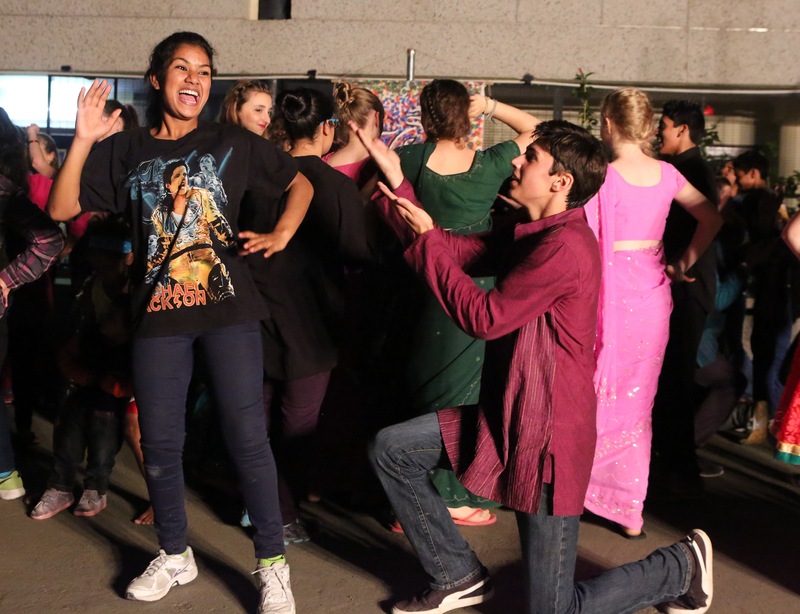 From the new-age hip-hop dancing that the boys brought to the stage, to the ornate intricacy of the girl’s dancing, each moment was fresh and exciting, and I was learning to dance with every clap of the beat. There was such a contrast between the reserved and awkward dancing that exists at our school dances and the ashram dance. 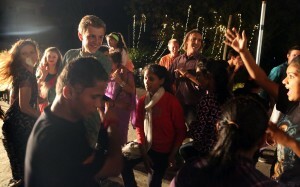 The ashram dancing was wild and had outgoing moves that bounced the stage and put smiles and sweat on our bright faces. Each song caused an uproarious cheer to surge through the crowd of people on the stage. People kept turning to me and saying, “Do like me,” as they busted out a move. They would then cheer and support me as I made my feeble attempt to imitate their seemingly flawless dance. As we danced the night away, I grew even closer to my new friends. I awoke sore and groggy the next day. It slowly began to dawn on me that my time at the ashram was dwindling. I rushed down the long flight of stairs that led to the courtyard, so that I could spend as much time with my new friends as possible before our departure. Over our breakfast of leftovers from the party and chai tea, I chatted with the boys about the fun we had the night before. I wanted to spend the remaining hours of my time at the ashram living in the moment and basking in the fresh and pure air that surrounded us. I moved to some shade under a tree and sat with my friend Narayan. We started playing guitar and beat boxing together for the people who sat around us. I moved to the trampoline and started doing flips with my friend Naresh, until the heat of the sun pushed us back into the shade. Two girls named, Priyanka and Parama called me over to take pictures with them. We all moved back under the grove of trees that sat in the middle of the cement plaza. We sat down on the cooled cement and started sharing stories of our favorite times at the ashram and the fun times we had had. Alas, the time to depart was growing close, and the unfortunate sound of goodbyes began to reverberate through the air. I stood in the center courtyard and began to turn and get a last look at the place. Our bus arrived and we loaded our luggage with the help of all the ashram guys. From my bus seat I looked out and saw the kids reaching through my open window to say goodbye one last time. Through the crowd I heard, “Goodbye Sage-Bhai!” I later found out that they were calling me brother. We pulled through the narrow ashram driveway and I turned around to see the kids huddled together waving goodbye to us. I reached out the window to wave back to my new family and my home away from home.